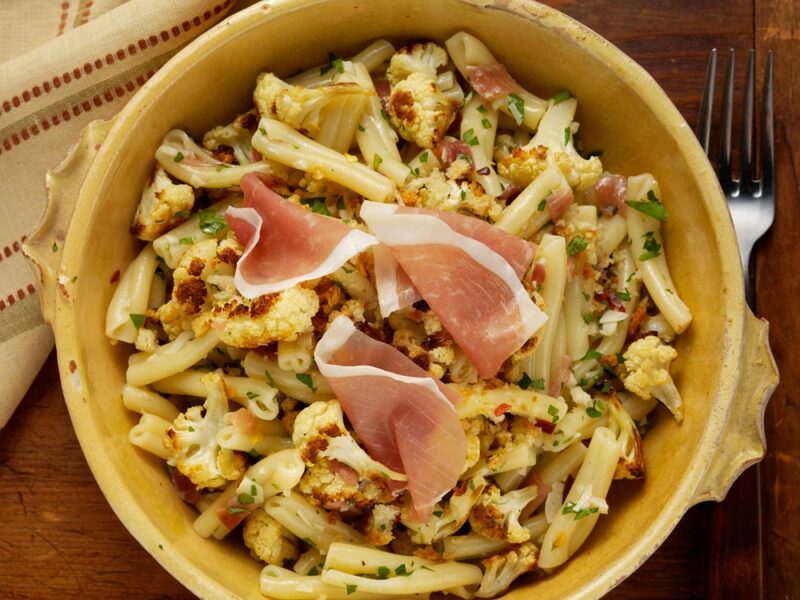 When your taste buds call for a dish that is fun, versatile and robust with a punch of heat, this one will skip to the front of the other pasta with prosciutto recipes. Fresh garlic, roasted cauliflower and zesty red pepper flakes turn a traditional baked ziti completely upside down. This savory and festive pasta with prosciutto recipe makes a compelling side dish that serves well cold or warm. To enhance its earthy essence, pair it with food-friendly wines that have low tannins and high acidity, such as a dry Italian Rosato or Barbera. Take a look below for a how-to video, from our Specialist retailer, Mariano’s Market. With a sharp knife, chop 4 slices of the Prosciutto di Parma (including all of the fat) into small pieces; cut remaining prosciutto into 1-inch strips; set both aside. In a food processor, pulse the bread to form crumbs. In an ovenproof pan, mix the breadcrumbs with 1 tablespoon of the olive oil; toast in the oven until golden and crisp, stirring once or twice, about 5 minutes. On a large baking sheet, mix cauliflower with 3 tablespoons of the olive oil and 1/4 teaspoon of the salt. Roast until browned, stirring occasionally, about 30 minutes. Meanwhile, fill a large pot with 4 quarts of water and add remaining salt; bring to a boil. Add ziti and cook until al dente, 10 to 12 minutes; when done, drain well, reserving 1 cup pasta water. While pasta cooks, in a large skillet over medium-high heat, heat remaining 1 tablespoon oil; add the chopped prosciutto and cook until crisp, about 5 minutes. Stir in garlic; cook until fragrant, about 30 seconds. Stir in pasta, roasted cauliflower and wine. Stir well, adding small amounts of pasta water as needed for a saucy consistency. Stir in parsley and hot pepper flakes. To serve, spoon pasta into shallow bowls. Top with prosciutto strips and bread crumbs.